Dutch public transport services are operated in the form of concessions. With a concession agreement granted by a public transport authority (there are 14 public transport authorities in the Netherlands), a public transport company has the sole right to transport passengers in a certain region or along a specific line. There are approximately 35 public transport concessions in the Netherlands. The Groningen Drenthe concession is one of the biggest concessions covering the provinces of Groningen en Drenthe, located in the northeastern part of the country with a total population of over 1 million. The concession provides public bus services in 32 municipalities, and serves approximately 270 million passenger-kilometres per year. 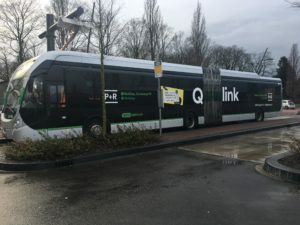 OV-bureau Groningen Drenthe (in English: Public Transport Bureau Groningen Drenthe), the public transport authority (PTA) of this concession, launched a new tender in December 2017 for the new concession period (2019 – 2029). For this, Fimotions assisted the tender team of Connexxion, a large public transport company that operates 14 concessions in the Netherlands. Fimotions’ main task was to develop a Sustainability Plan aimed at substantially reducing CO2 emission from the public transport operation by deploying zero-emission buses, with a focus on electric and hydrogen buses. The PTA requires the deployment of zero-emission buses in the main cities (Groningen, Assen, and Emmen) to make cities more liveable and to protect dweller health. This is also to support the ambition of the Dutch government that starting in 2025 all new buses that come into operation must be zero-emission vehicles. Due to the large concession area and the long distances that buses must cover, deploying electric buses is very challenging. Despite the development of battery technology, the urban range of a bus on full batteries is still limited compared to buses running on fossil fuels. Therefore, a robust charging strategy is needed in order to establish a charging infrastructure in the most efficient way possible.